Crystal War Blood Field iPhone Game Review. In a land where humans and goblins share the same territory, the sound of battle horns and goblin caves trembling is inevitable. Especially when this land bares numerous crystals, that neither goblins, nor humans want to share with anybody else. In this crystal war, which side are you willing to choose? Pick your adversary and let the battle begin. 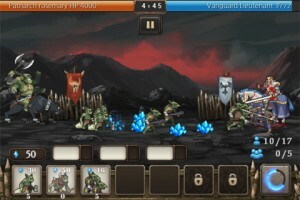 Crystal War is an exciting and extremely challenging game, a defend-the-castle type of game,, where you have to create an army and fight the Goblins or Humans, depending on which side you choose to protect. The goal is to defeat the hero of the opposite army, while you are being attacked by the army that is protecting him. Choose a side and put your strategy in action. At the beginning, you only have five things to help you defeat the enemy, so choose wisely how and when to use them. 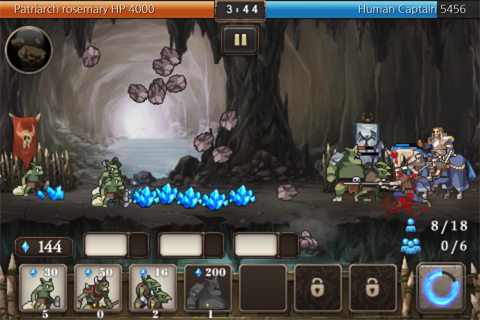 There are workmen, who harvest the crystals that you need to activate different type of units, two different kinds of fighters, and two types of magic that activate according to your progress in the battle. But that's just the beginning. There are more exciting things waiting along the way. One thing’s for sure in Crystal War. It’s pretty darn hard, and the time element has a lot to do with it. I’ve lost a good few battles because even though I was winning, I wasn’t winning fast enough. You have to defeat the enemy hero within the first 5 minutes of the game, so each level will only last 5 minutes tops. If you don’t take him down in those 5 minutes, you are defeated, no matter if you were a couple of blows away from striking him down. In general, my strategy has been to create a handful of workers at the beginning of each level, and put out fighters only after I have at least two workers gathering crystals for me. After that, I would constantly create fighters, while putting out one worker for every 7-8 fighters I created. That ensured me a constant supply of crystal and a constant supply of fighters willing to die. This strategy has gotten me through the first 5 levels without a sweat. The sixth level proved that I needed to adjust my strategy and create more fighters, but then I would need to keep a close eye on the crystal supply levels. Add to this the fact that the workers are mind-boggling idiots and go to gather crystals on the opposite side of the battle field, way behind enemy lines, and you’re bound to have to strike a good balance of workers vs. fighters that’s different for almost every level. 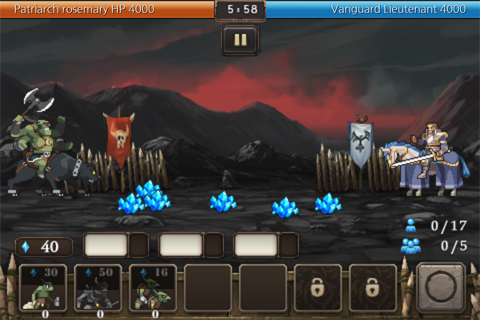 When playing Crystal War, you can choose to challenge other people or play by yourself. For each mode you chose, you’ll have to either try and defeat your adversary in a limited period of time, or fight for an unlimited period, until one of you is defeated. 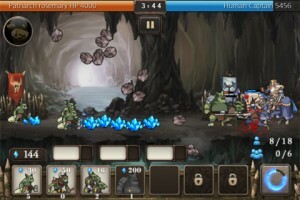 Each gameplay option comes with its own difficulties, so don't think that fighting with no time pressure is any easier than struggling to bring the enemy hero to its knees in a couple of minutes. Crystal Wars will carry you through more than 40 levels, where you will discover 12 types of different magic, and be able to fight along with 16 different types of units, if you choose to be a human, or 13, if you're a goblin. 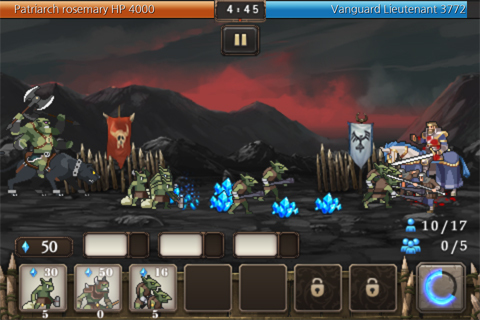 With each fight you win, you earn cash that you can use to buy unit, magic or other items that can help you complete your quest. And no matter if you're fighting or just preparing to buy an item, you constantly have to calculate your every move to make sure that you make the right choice. Choosing to buy a certain spell, upgrade a unit or create a type of fighter instead of other might prove to be the key element in deciding the fate of the battle. And another great thing about Crystal War is the storyline. Since you can choose which side you want to fight for, the storyline helps you better understand the cause of the rivalry and how the two sides think, so that you can get more involved in the game. And with every level you clear, a new battle begins with a story of its own. There's no doubt about it: Crystal War Blood Field is a game that you will play over and over again. Not only because it's so challenging that you'll find yourself struggling to clear a certain level for hours. But also, because it has that certain something that gets you hooked from the first minute you pick your side. Crystal War Blood Field is a universal download for the iPhone, iPad and iPod Touch. What do you think of Crystal War Blood Field ? Scroll down for our comment section and let us know! Exotic Locations. Relaxing Music. Childhood Memories. Skipping Stones!